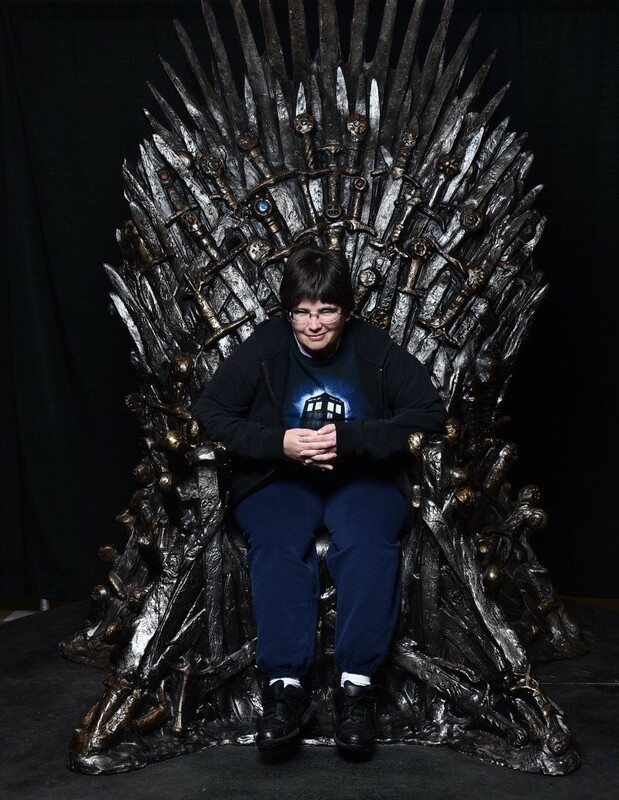 Wizard World Chicago 2017 Photos, Part 4 of 5: Objects of Affection « Midlife Crisis Crossover! 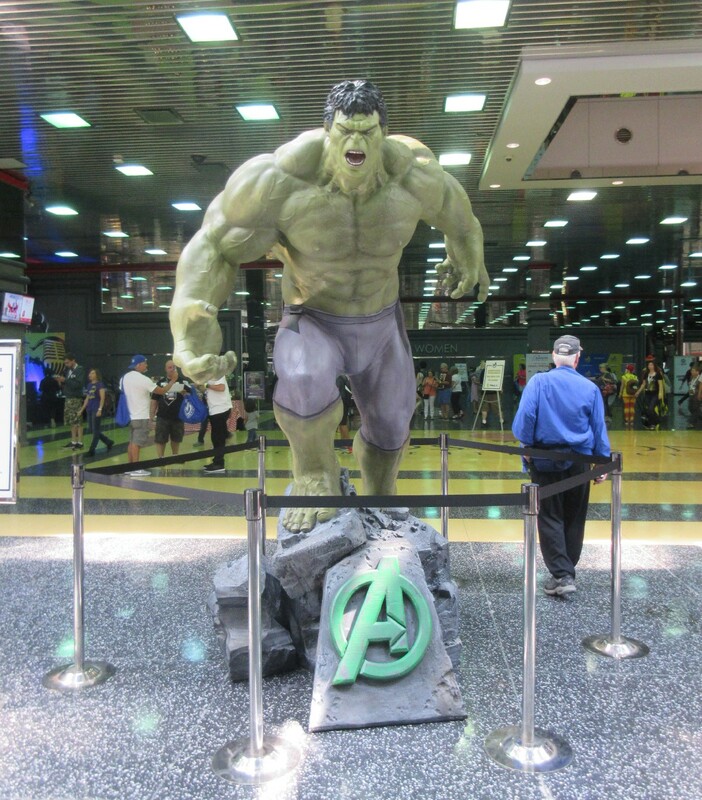 Once again the Hulk statue is your greeter as you enter the Donald E. Stephens Convention Center and the wild world of geek wonder. 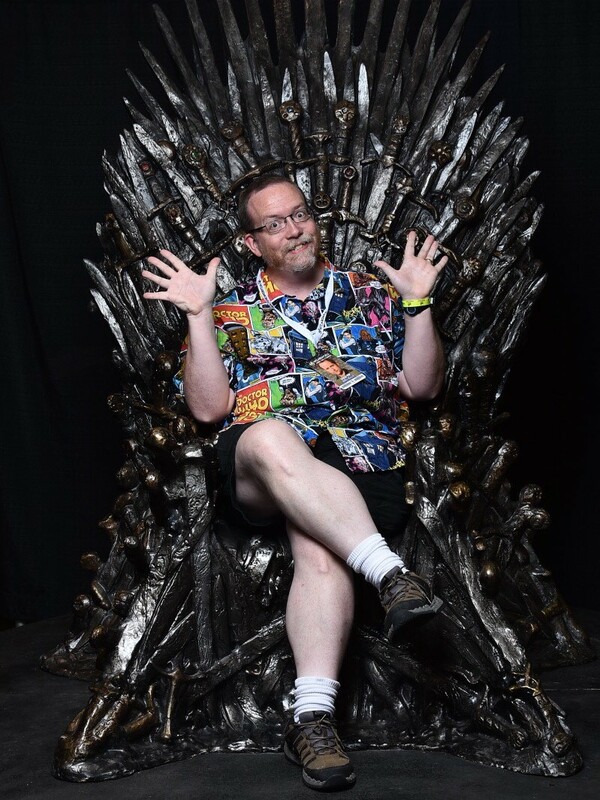 One thing we noticed as we walked Halls A and F this year: conventions really aren’t just for middle-aged dudes flipping through dusty back-issue boxes to complete their Green Lantern runs anymore. Clothing, headgear, jewelry, makeup, and other accessories figured into dozens of booths across WWC, giving several aisles the vibe of a chic collective of pop-up boutiques. Magazines and prints with nekkid wimmens still peeked through here and there alongside the CGC-graded rare comics, but the geek spectrum today is wider than ever, and retailers and innovators have reconfigured or risen anew to cater to all the shopping preferences beyond the original definition of “comic con”. While fans keep debating the merit of letting Hollywood actors invade the traditional comic collectors’ turf, many exhibitors have rolled with the changes and reaped the rewards. 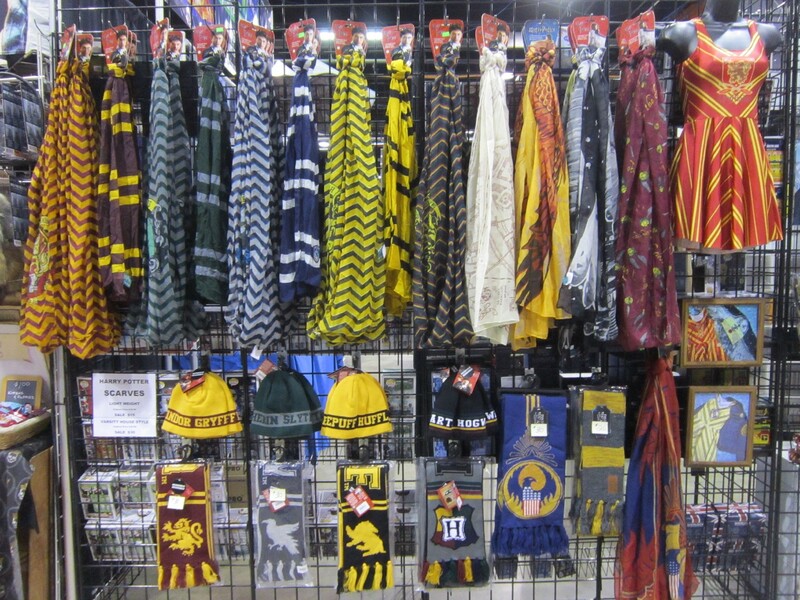 Dress how you think the Sorting Hat would see you, or make up your own British fantasy boarding school and design your own unique clique color scheme! 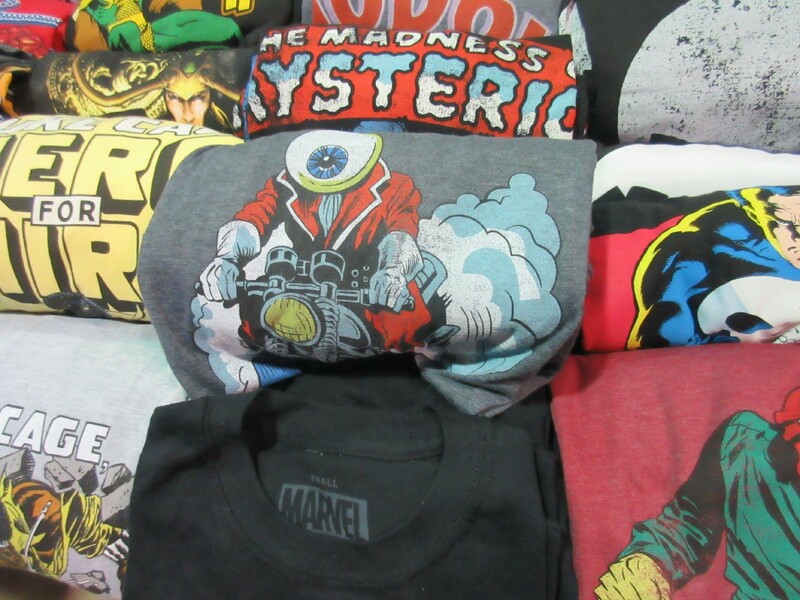 Usually cons are where I stock up on new shirts, but when third-string Ghost Rider loser villains like the Orb are getting plum licensing deals, I gotta wonder if maybe it’s time to take a break from T-shirt shopping for a while. Attendees who bought VIP badges tied to one of the show’s five Doctor Who-related guests was entitled to a tote bag overstuffed with Who merchandise. If that wasn’t enough for you, the folks at Wibblywobblytimeywimey brought even more options. 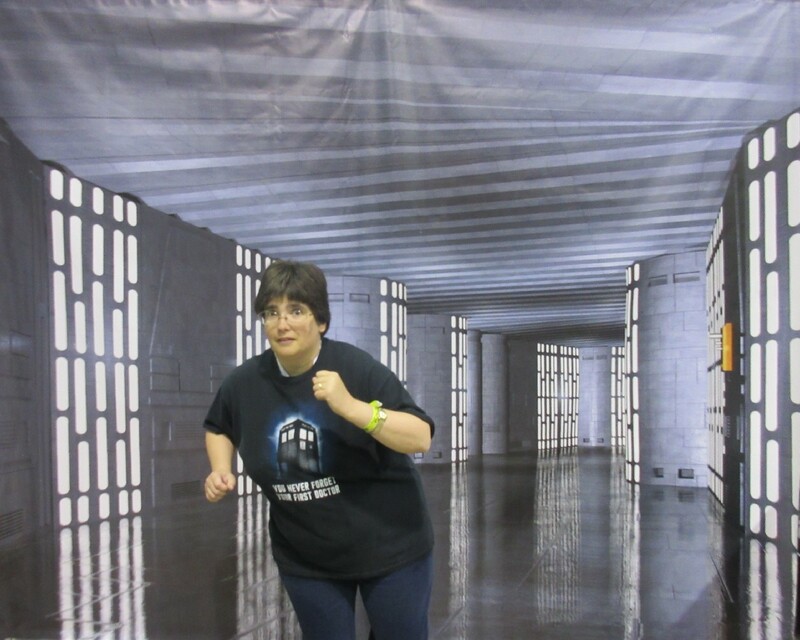 Wibblywobblytimeywimey were also among several proprietors who festooned the festivities with props, mannequins, backdrops, and other photo-op materials to lift your spirits and brighten your selfies. Anne enjoys tea time with inanimate Madame Vastra and Strax. 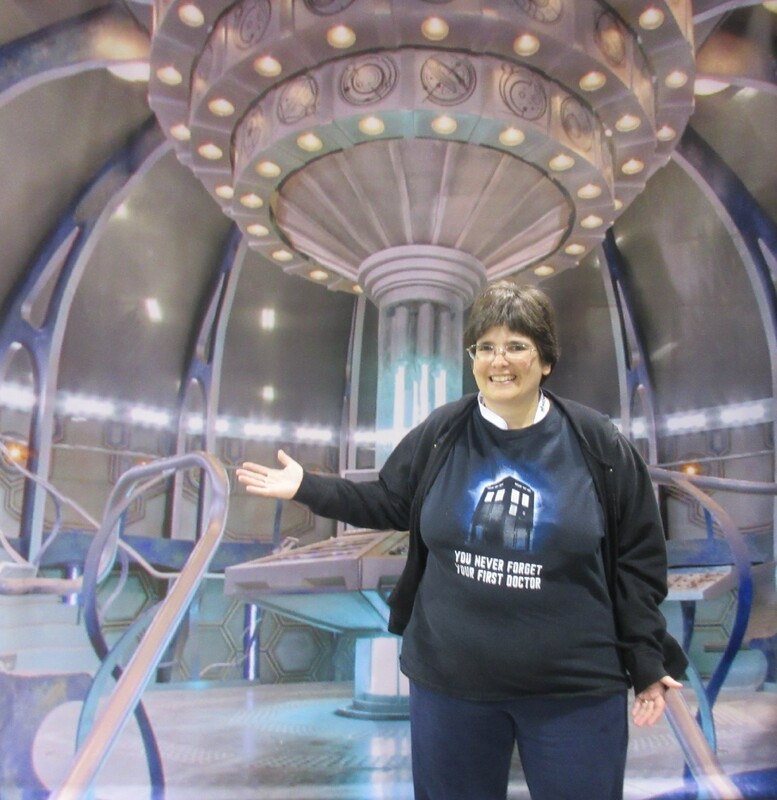 A convention exclusive: a TARDIS that’s flatter on the inside. 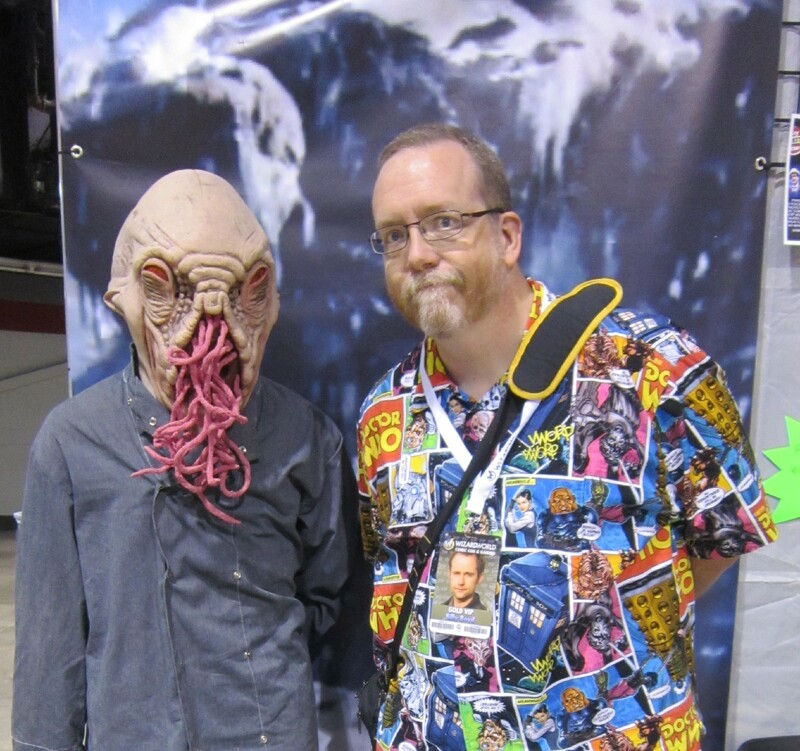 In case you’re a dude in a mood to brood with an Ood. Not to be outdone, of course the 501st Legion, that stalwart Star Wars fan community supreme, brought sci-fi ambiance in their own fashion. 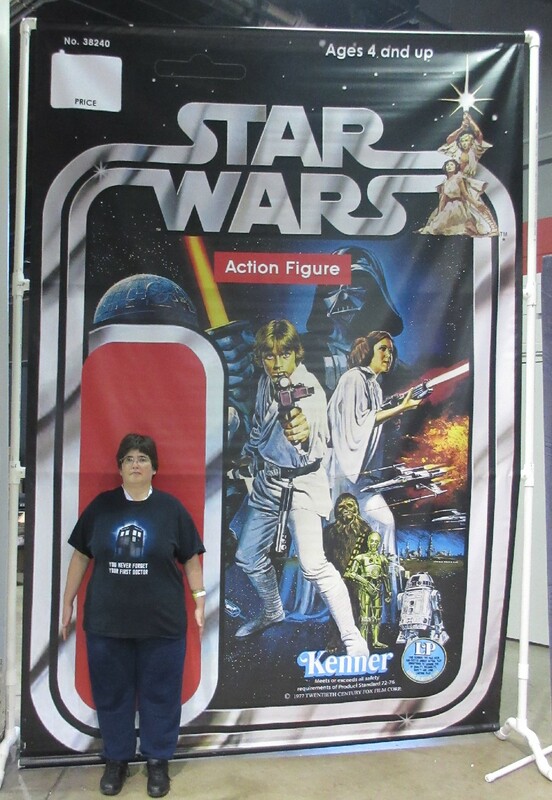 It’s the all-new collector-classic Anne action figure! In the proud tradition of 1980s girl figures, she’s equipped with zero points of articulation! Everyone talks about how murderous the Death Star is, but no one talks about how its hallways make great jogging tracks for upping your daily Fitbit totals. The Empire needs heart-healthy soldiers too! Our new favorite development in con sales: food vendors! With very few exceptions, the convention centers in every major city feature the kind of concessions engineered to invoke childhood nostalgia for school cafeteria cuisine, by which I mean their fare is largely awful and tastes like detention. Thankfully for us and for the grateful fandom at large, clever chefs are turning their talents toward our fields of interests and catering to our caloric needs. Their products largely aren’t any healthier, but you gotta have some kind of fuel to keep walking those miles of aisles for three days straight. Two particular oases of awesomeness were Best in Show on our scorecards. 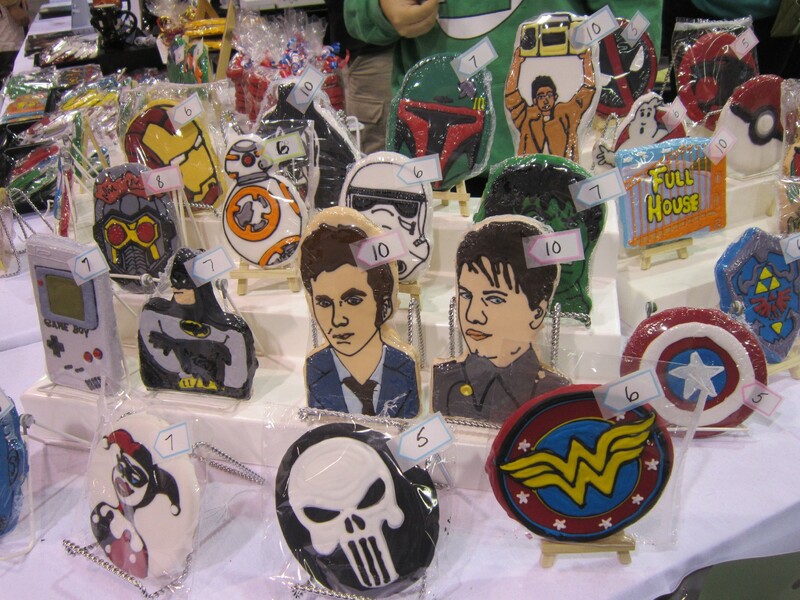 We’ve raved before about the iced sugar cookies from Chicago’s own Max & Benny’s. 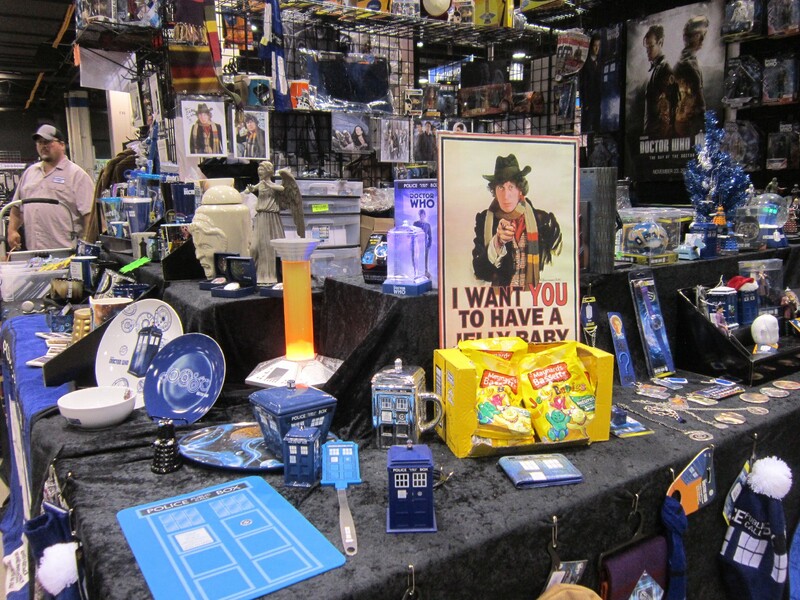 This year’s assortment brought new, show-specific designs including the Tenth Doctor, Captain Jack Harkness, and Lloyd Dobler and his boombox. 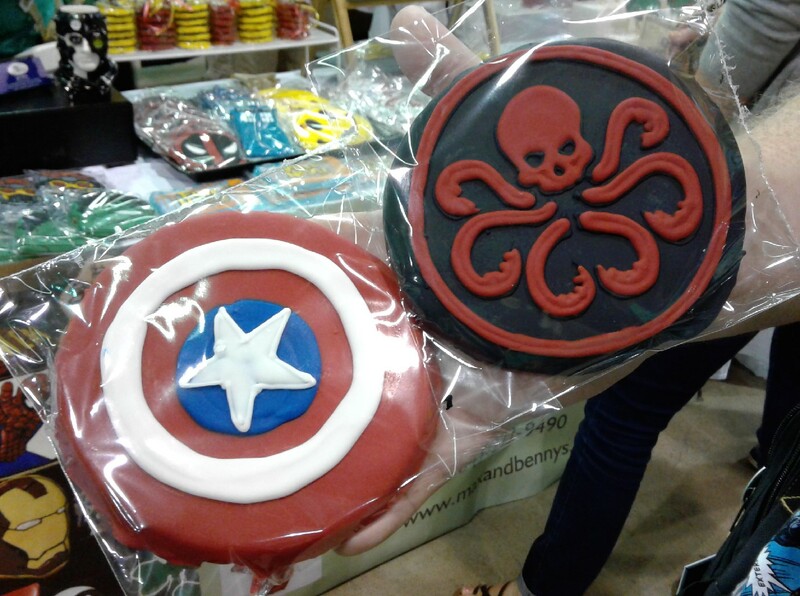 Anne and I respectively bought Cap and Hydra cookies, because we just had to taste both sides. Turns out they’re identical on the inside. That’s, like, deep. 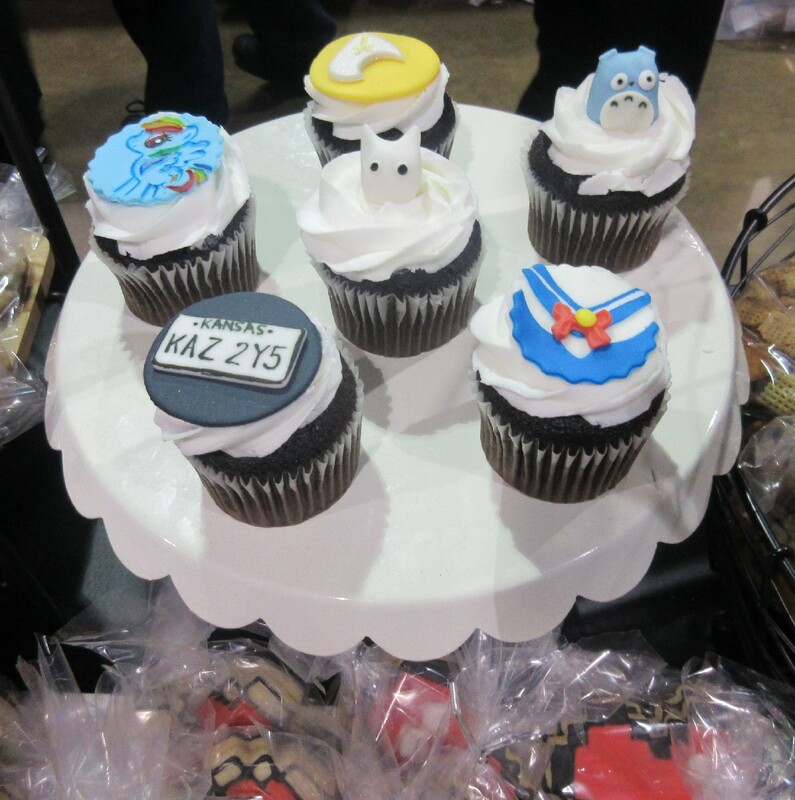 New to the show this year was Crumby Art Bakehouse and Cakery from Elm Grove, WI, who specialize in candies and cupcakes. 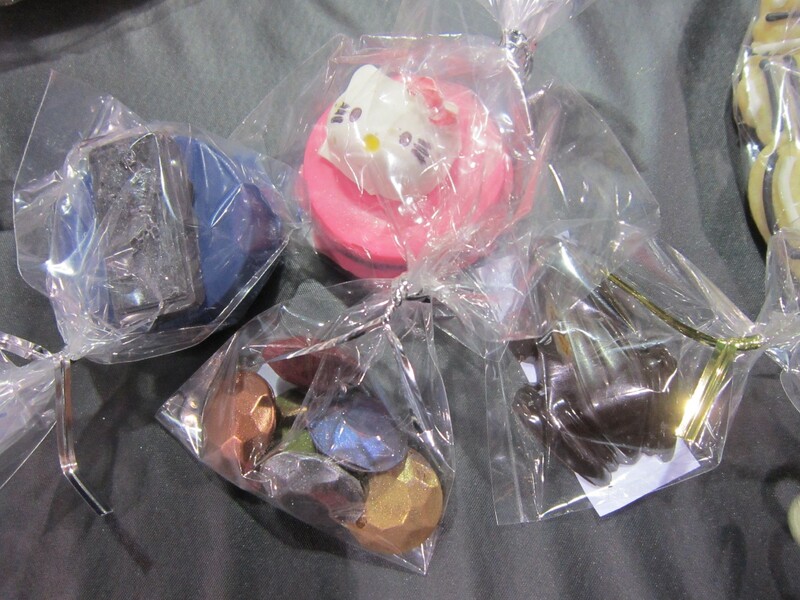 Our haul included chocolate frogs, edible Infinity Stones, and chocolate-covered Oreos topped with Hello Kitty and Han Solo in carbonite. 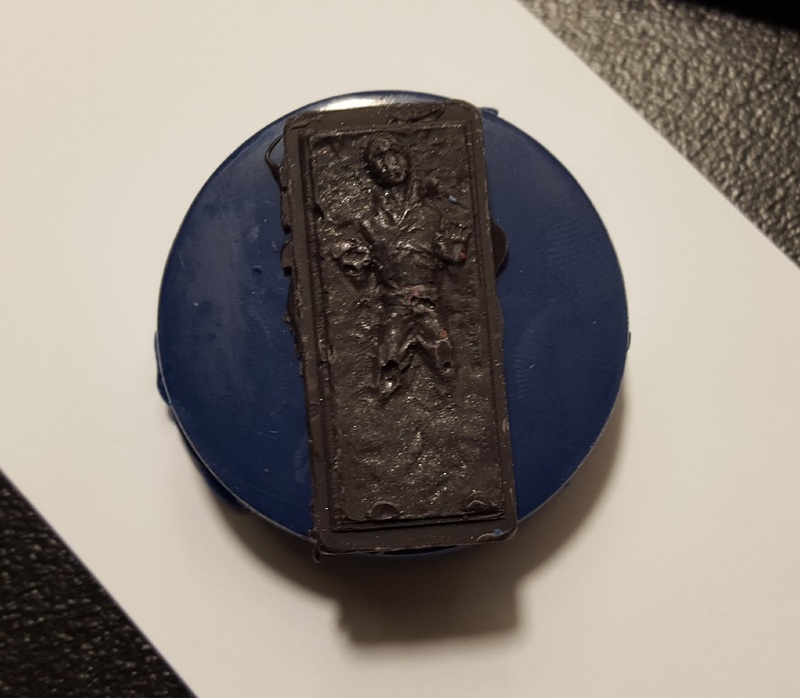 A better view of my carbonite cookie. 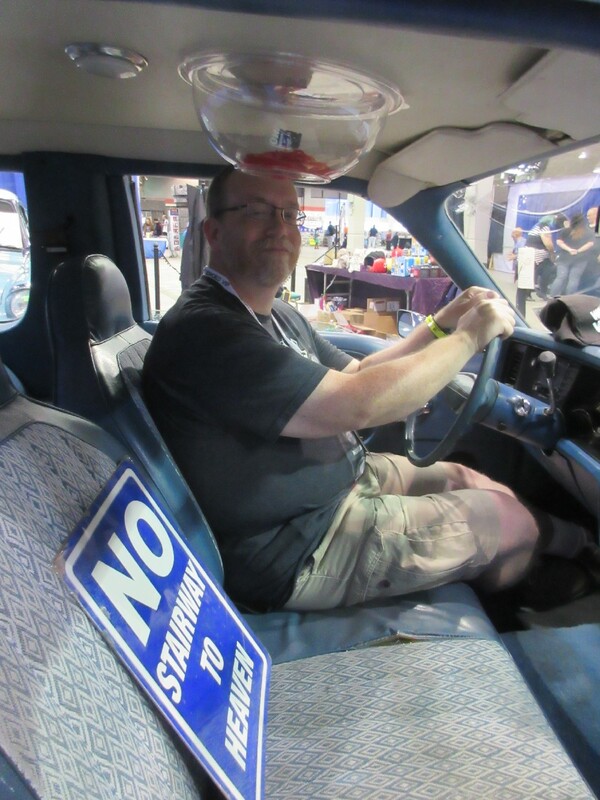 This year’s geek car show was up in Hall G on the second floor, sequestered from the main exhibit areas. Many fans had no idea they were up there till after WWC was over. Plenty of elbow room but not many paying customers, which is a shame. Some of my favorite WWC moments happened up there. 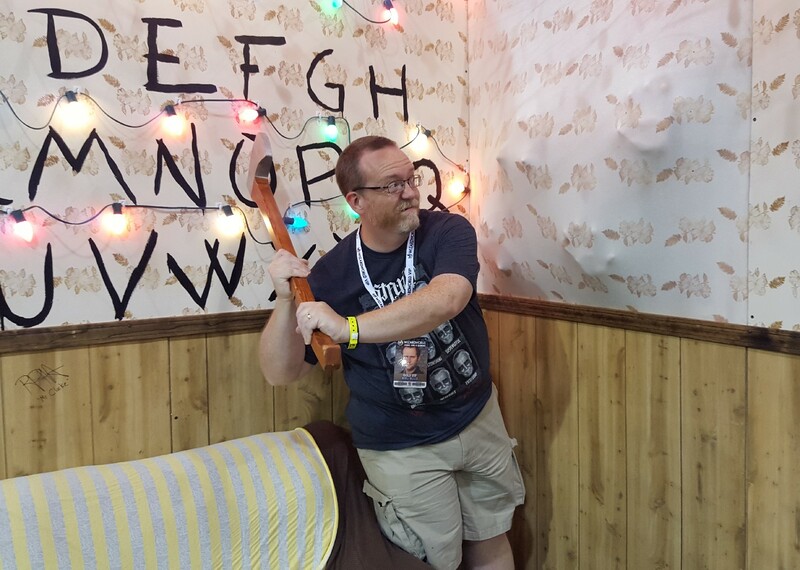 The best new diorama was the Byers living room from Stranger Things, where you could pretend to wield Joyce’s trusty ax against invaders from the Upside Down, or possibly Amway salesmen. 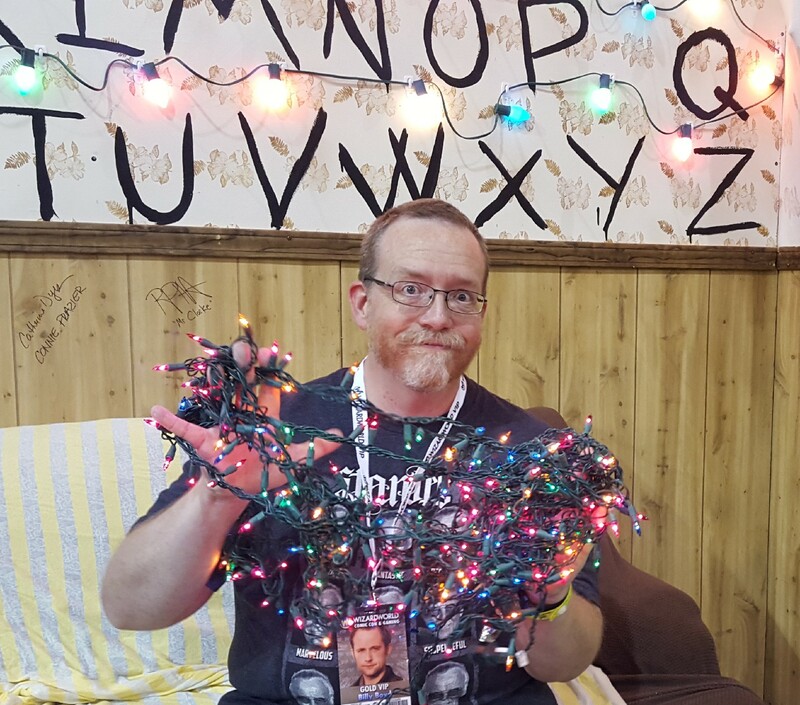 Or you can borrow Joyce’s Christmas lights and see if you can get through to poor missing Will. Trying to communicate through jazz hands yielded mixed results. 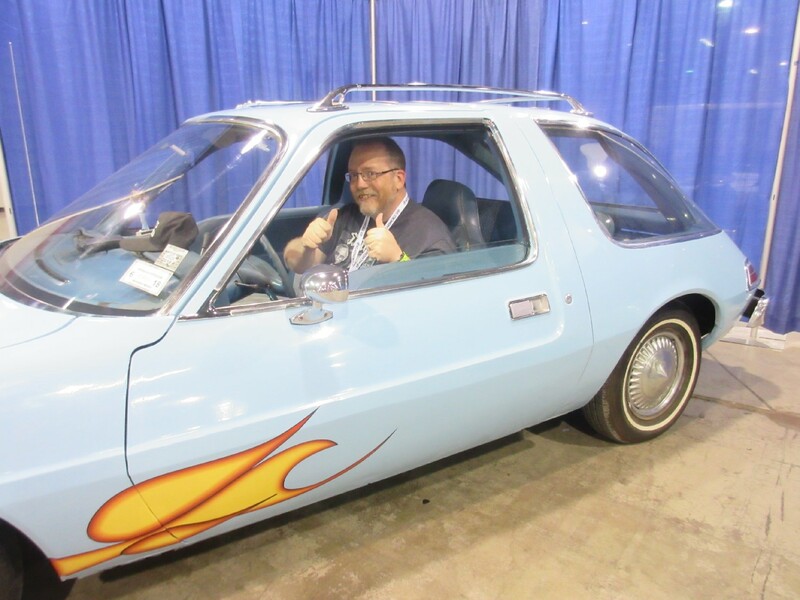 Young-adult me would be so jealous if he knew one day I’d get to sit in a spot-on recreation of Wayne Campbell’s AMC Pacer from Wayne’s World, the greatest Saturday Night Live film of all time. Extra features include the ceiling licorice dispenser and the “NO STAIRWAY TO HEAVEN” sign from the music store. 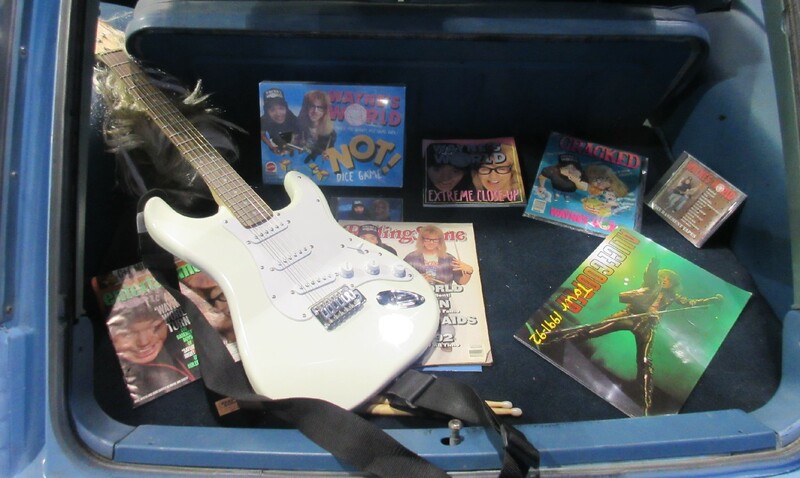 In the trunk was a bevy of Wayne’s World souvenirs. I owned three of these keepsakes. 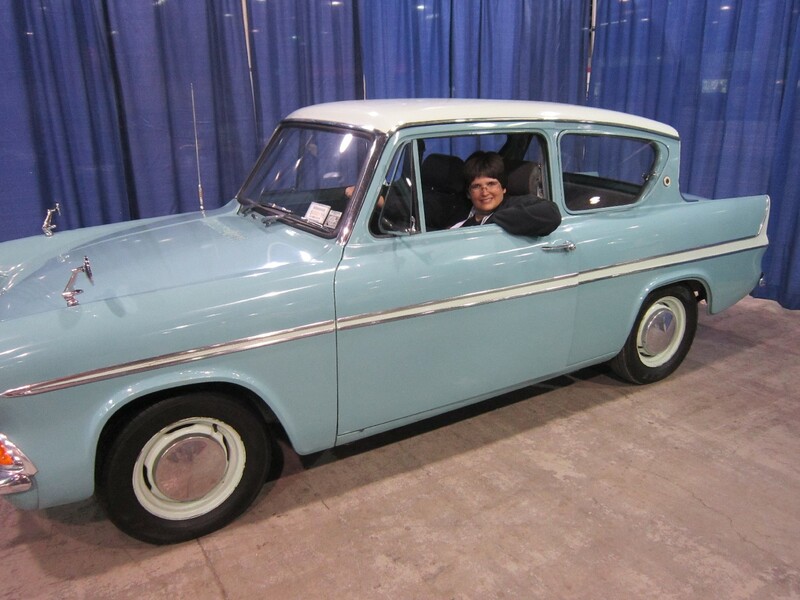 Meanwhile next door, Anne pretended to test-drive the Weasley family’s Flying Ford Anglia from Harry Potter and the Chamber of Secrets. 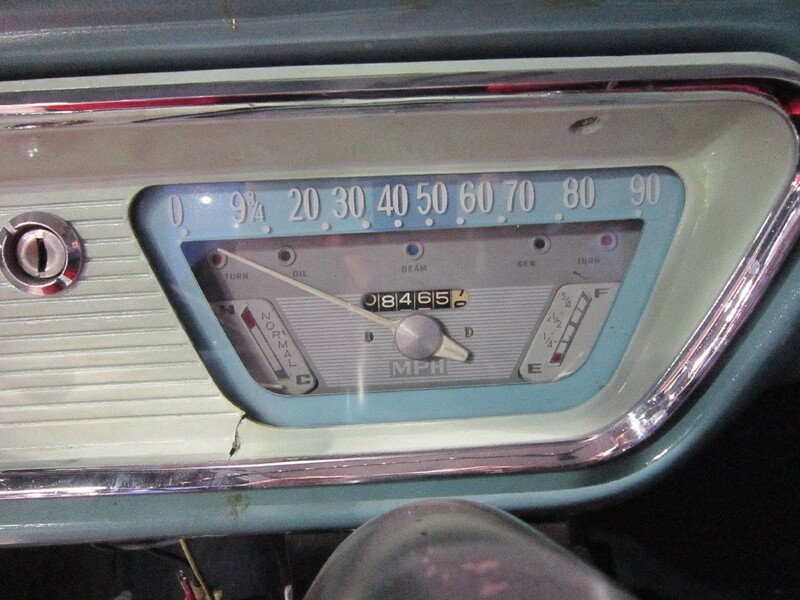 Fun li’l Easter egg on the Anglia’s dashboard if you know what you’re looking for. 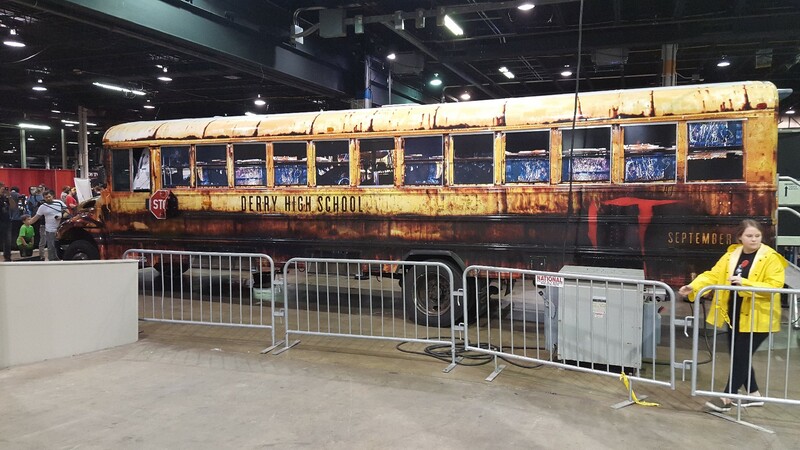 Not to be outdone by small businesses, New Line Cinema trotted in an entire school bus equipped with some kind of “VR experience” inside to promote their upcoming reboot of Stephen King’s It. It was kicked out Friday due to fluid leakage but returned Saturday in better condition. …and those were just some of the better things to stick out among the things. We haven’t even gotten to the people yet, the reasons we were there. 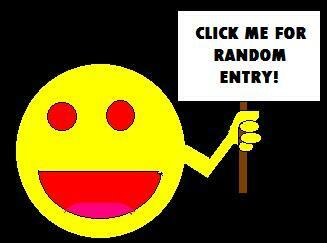 Some of them were keen, too. I’d totally watch the show if there’s ever an episode where Peter Dinklage does exactly this.